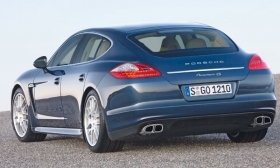 Since April, we have been Porsche produces the new Panamera (shown) and the Cayenne SUV on the same line. LEIPZIG -- Michael Macht, Porsche's board member in charge of production and logistics, says the sports car maker is adopting new methods in materials management and work organization. He also says new logistics opportunities are arising from cooperation with Volkswagen. Macht, 48, has been a member of the management board since 1998. After his university training in mechanical engineering and four years at the Fraunhofer Institute, Macht arrived at Porsche as an engine planner. He later worked as consultant to Porsche CEO Wendelin Wiedeking on Project P.O.L.E., which pursued process improvement through supplier integration. Macht spoke with Automobilwoche Reporter Henning Krogh. Porsche is launching its fourth model line, the Panamera. What innovations in production logistics have you been able to carry out for this new model? In Leipzig, we have succeeded at something unique in the world. We have realigned our factory in just a few weeks as production continued. Since April, we have been producing the Cayenne SUV and the Panamera sport coupe on a single line, in the full mix, without restrictions. That is one innovation. The second highlight in our factory is the logistics plan. With this new system, the entire production network including all suppliers, manages to function with almost no warehousing. With a lead time of seven days, our suppliers receive exact production data. So one week before a Panamera is placed on the line, the supplier starts production of its run, and this is precisely in the sequences that we provide using the material call orders. Porsche sources painted body shells from VW in Hanover. How are the logistics for this synchronized? As our largest module supplier, VW receives a preview of the needed Panamera body shells, with a lead time of six months. That enables our colleagues in Hanover to manage their purchase of materials and the needed capacity. The detailed planning then takes place with a lead time of one week, just as it does with all suppliers. Does Porsche have separate logistics facilities for the Cayenne and Panamera or are they combined? Logistics at the Leipzig plant is all of a piece. The backbone of the new system is a common zone for making out production orders, which provides parts for the production of the Cayenne as well as the Panamera. That means we are basically talking about a joint system. For the Panamera, however, some assembly runs come in longer than those for the Cayenne. Against this backdrop, large modules such as cockpits are delivered directly to interior assembly "just in sequence." That is the "logistical difference" between the two vehicles. Porsche also maintains a so-called painting circle with VW. What are the goals of this circle? Porsche is involved in a range of expert circles with other manufacturers on basic technology. We are active on a panel with VW on the use of painting equipment or on standards. For example, paint experts share information on materials of the future. What are the logistical strengths for Porsche and for VW? Every Porsche is an individualized vehicle. And our greatest strength lies in the extremely high variance of our products. We produce "tailor-made" sports cars reliably, with high quality, and profitably, despite low production runs. As a high-volume manufacturer, VW naturally has other requirements and is logistically very well positioned in the facilities that I am familiar with. Porsche and VW want to form an integrated automotive company. Are you already planning more joint projects with your Wolfsburg colleagues along the lines of the Panamera? At the moment, we are fully occupied putting the Panamera on the road with the highest possible quality and in the right volumes. In addition, we haven't currently agreed on other comparable vehicle projects with VW. Porsche recently named transmission maker Aisin "supplier of the year." How did the Japanese firm stand out? It's no accident that Aisin, a Japanese firm, was chosen "supplier of the year." As you know, the Japanese auto industry, in addition to a rather small German sports car manufacturer with its headquarters in Zuffenhausen, is the global model for lean, effective production. And Aisin's achievements are noticeable. We regularly measure performance criteria such as the delivery service of our suppliers. Not once has Aisin delivered a single transmission late. And we have had no quality deficiencies to complain about with regard to their products. Porsche has reacted to the auto slump with a number of short-term shutdowns over the past few months. Are you planning more days off in manufacturing and logistics? During this business year, there will be still more shutdowns, which have already been announced. Our extremely flexible working-hour models serve us in good stead. Is Porsche anticipating a reduction in working hours? No, we aren't thinking about that. After a number of improvements in supply chain management, Porsche has long been considered an especially lean company. Is there actually any room for improvement in logistics? By all means. Just think about the highly innovative methods in the Panamera's production and logistics. At the moment, we are building 10 vehicles a day. Soon it will be 90 a day. During this increase, we will demonstrate further possibilities again and again. And even if they are small, they carry considerable weight in total. Logistics is like the Porsche 911. You think you just can't make it any better. And then the next 911 shows you can.